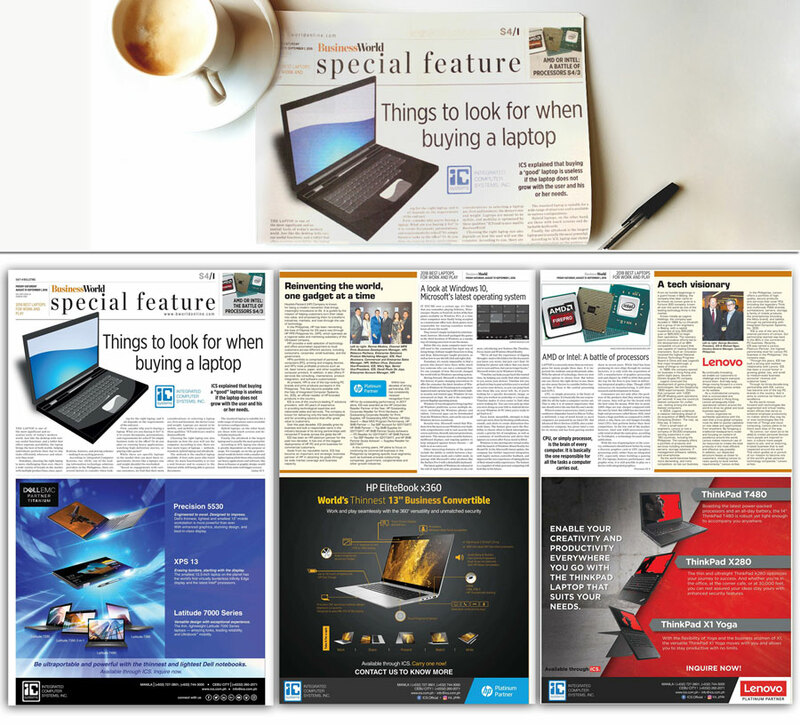 In the August 31, 2018 issue of BusinessWorld, they had a special feature on “2018’s Best Laptops for Work and Play” and it contained articles on ICS and its partners HP, Lenovo, and Dell. In the main article, ICS explained what defines a good laptop choice and what we can expect to see in the future of mobile computers. You may read the online versions here, here, and here. I agree to receive ICS Newsletter and product updates. On-site diagnosis, isolation and assessment of computer related technical problems; troubleshooting and preventive maintenance of PCs, laptops and printers. Answer/assist customer queries or other IT concerns. A degree holder in any computer related course. Preferably (1) year working experience in hands-on technical support, in an IT or related industry. Above average communication skills and with strong customer service orientation. Fresh graduates are welcome to apply, provided with related exposure during internship. Safekeeping of the legal and bank documents of Cebu branch. Has excellent communication/telephone skills, smart and with pleasing personality. 1 year experience as Receptionist/Telephone Operator or Front Desk Personnel is an advantage but not a must. Function Room Reservation, Room Set-up and Beverage Requirement Coordination. Requisition, issuance, monitoring and maintenance of IT service units and fixed assets. Procurement of necessary materials needed by the department in peformance of tasks. Preparation of inventory reports; active fixed assets, user assignments, location, configuration, etc. Establishing an effective tracking/recording and monitoring system. Assist in handling customer inquiries and requests for services to meet and satisfy client’s needs and demands. Filling and photocopying, routing of documents. A bachelor’s degree graduate of any course. Related work experience is an advantage but fresh graduates are welcome to apply. Recruitment, placement, manpower monitoring and record management. Employee relations, corporate policy formulation and implementation. candidates to assessment, interviewing, hiring and placement. Knowledge in psychometrics, employment and labor laws. Proficient in MS Office applications such as Word, Excel and PowerPoint. People oriented and able to communicate comfortably in English, both in oral and written. Plans effectively; systematic, multi skilled, and well- organized. A Bachelor’s Degree holder of Human Resource Management, Psychology, Behavioral Science or any related course. Handles and coordinates assigned service projects and contracts. Initiates, follows up and confirms service proposals to customers. Ensures profitability of each service agreement, attainment of revenue targets, and compliance with service level commitments. Knowledgeable in computer hardware and software. Excellent customer service and with good communication skills. Flexible, aggressive and highly dependable. recommending network solutions and products to customers as necessary. With at least 3 year technical experience with at least one year as Network/Service Engineer. Excellent communication skills with strong customer service orientation. Willing to be assigned in Makati City. Conducts product / solution presentation or demo. Executes Proof of Concept (POC) and provides Scope of Work (SOW) based on recommended solutions. Works directly with the customers, account teams and solution architects to help plan and design optimal solutions. Works closely with various technical consultants and/or engineers to identify and resolve issues. Maintain a high level technical expertise in industry trends and technologies. Experienced in Solutions Design and Implementation. Related experience in Product Research is an advantage. Strong background in Network Security Analysis and Design. Minimum 2 years related experience in IT Consultancy, Product Research, Training and Support. Has attained any technical certification from major IT brands or IT certification institution. Precision Cooling, Uninterruptible Power Supply) & related components. Strong background in Networking & Security technologies (specifically with Cisco, HP or related brands). Excellent communication skills and with strong customer service orientation. Achieve effective system support and maintenance to various clients of SAP B1. Conduct system testing and technical evaluation of the department’s systems and applications. Ensure Service Level Agreement (SLA) are met. Enterprise Resource Planning (ERP) / SAP B1 implementation. Please fill-in your details in order to download any file. Conducts on-site assessment of printing environment at customer’s site. Generates reports and fleet analysis based on the assessment and recommend future fleet based on this analysis. Performs printer configuration and installation. Conducts Proof of Concept and demonstration on OPS proposals. Perform break-fix/repair of printer devices deployed at client’s site. At least College graduate in any computer related field. Office Printing Solutions experience is a MUST. At least familiarity with Bill of Materials and Proof of Concept. Above average written and oral English communication skills. Strong background in Virtualization technologies (specifically with VMWare). Working knowledge on Server & Enterprise Storage such as iSCSI and/or Fibre Channel with network technologies. Strong background in Data Center Power/Cooling Systems (Power Management, Data Cabinet Storage, Precision Cooling, Uninterruptible Power Supply) & related components. Researching and creatively prospecting new business opportunities. Establishing and expanding strong relationships with corporate clients. Interfacing with senior level decision-makers, and communicating the business value proposition in a consultative manner. Managing corporate accounts and achieving and/or exceeding aggressive revenue targets..
A self-starter, with high energy, inquisitive, results-oriented, passionate, and a natural leader. With excellent communication skills and extraordinary amount of professionalism. Extremely responsible, with an open and engaging personality, and a quick mind. A degree holder in any IT or business related course. With two (2) years corporate sales experience handling IT solutions and enterprise products. growing a strong talent pipeline. Develop and implement recruiting plans and strategies designed to fulfill company staffing needs. Collaborate with department managers on regular basis for their manpower requirements. Assist in manpower development activities and employee events. Proficient in word processing and spreadsheet systems. Graduate of a degree course; fresh graduates are accepted. Provide Technical support and services to internal and external customers. Provide Technical support for In-coming Quality Control Testing of shipment arrivals. Degree course in IT, electronics and other related courses. Must have either CISCO CCNA certification and/or TESDA certification on Computer Hardware Servicing NC II. Organized, dependable, has iniative and sense of urgency. Enter in the sales system, orders, coordinate delivery schedule & monitor invoice and delivery receipt until payment processing and collection. 20 to 26 years old. Review and prepare Contracts /agreements and templates. Coordination for board Meeting & preparation of Board Resolution and secretary certificate for bidding and other requirements. Filing of legal documents and corporate documents for government agencies. Orientation of sales on the issue on legal matters. Other assistance to SVP and President. Graduate of Bachelor of Law or Juris Doctor who are “under-Bar”. Has knowledge of legal terms and procedures. With high level client service skills and above average oral and written communication skills. Experience in legal work preferably in a corporate environment is an advantage. Will conduct first level and second level qualification for new/prospective accounts and leads qualification/generation for different products positioned. Bachelors’ degree in Business Administration Marketing/Management. At least 1 year experience in research and lead generation/prospecting. Must be resourceful and willing to do admin work. Will assist in daily recording of inventory related transactions, including offshore entries & cost adjustments. Will assist in month-end reconciliation of nominal & real accounts. Checks & monitors liquidation reports, reimbursements & claims. Assists in conducting physical inventory count at year-end. Preferably with 1 year experience, but newly graduates are welcome to apply. Can work well under pressure and have strong sense of urgency. Must be attentive to details and with good analytical skills. Conducts product / solution presentation, evaluation, demo or Proof of Concept (POC) and testing. Will work directly with the customers, account teams and solution architects to provide technical recommendations. Work closely with various technical consultants and/or engineers to identify and resolve issues. Minimum of one (1) year of working experience in the related field is required for this position. Server and Storage experience is a MUST. Minimum 2 years hands-on experience in designing both Networking (Switching, Routing, Wireless, LAN, WAN) and/or Security (Firewall, Intrusion Prevention Detection). Achieve effective system support and maintenance to various clients of iVend retail products / SAP B1. Perform successful deployment of POC (proof-of-concept) and system demo of business solutions. Bachelor’s degree in Information Technology or any related course. Accounting degree is a plus. At least with 1 year working experience in System Testing, Implementation and Support, preferably in Enterprise Resource Planning (ERP) / SAP B1 implementation. Excellent communication skills and strong interpersonal skills. Willing to be assigned in San Juan, Metro Manila. Client Computing (Desktop, Tablet, Notebook and the likes) experience is a MUST. Familiarity with Bill of Materials and Proof of Concept. Knowledge on applications development; work experience in a business environment is an advantage. Strong background in systems analysis and design. Willing to provide on-call production/project support during off-hours. Possess winning attitude and has strong customer service orientation. Working knowledge on IT Security infrastructure and products such as firewall, network access control, intrusion prevention/detection, etc. Certification in Cisco and/or HP is preferred. Working knowledge on Server & Enterprise Storage such as iSCSI and/or Fibre Channel with network technologies and Unified Communication (IP Telephony, Video Conferencing, Telepresence). Related experience in Product Research is preferred. Conducts product / solution presentation or demo.. Minimum 3 years hands-on experience in designing both Windows Infrastructure (Active Directory, Network & Security) & MS Exchange Messaging Application. Certification in MS Windows Infrastructure or MS Exchange is preferred. Cost effectiveness of the project based on the established and agreed upon timeline. Candidate must possess at least Bachelor’s/College Degree in any computer related course. Support and maintain LAN/WAN including troubleshooting, monitoring, configuration and documentation. Handle Server, PC and Peripherals. Manage Voice and Digital Lines i.e. cabling, terminating and PABX programming of telephones and peripherals and evaluating, troubleshooting, planning and recommending changes and upgrades to PABX systems. Administer internet connection and configuration to client computers and recommend solutions to related concerns. Graduate of BS Electronics and Communications Engineering or BS Computer Engineering. Competent in using Windows Operating Systems, Microsoft Office, Antivirus, Lotus Notes, MS Outlook, and other desktop applications. Analytical, aggressive, can work with minimum supervision. Able to provide on-call production/project support during off-hours (including weekends / holidays). Organized, works effectively with others (good interpersonal skills); Possess winning attitude and good working ethics; Strong customer/client service orientation. Work related experience is an advantage but fresh graduates are welcome to apply. Assist in the design, implementation & monitoring of marketing plans to achieve target revenue and margin. Provide effective marketing support to Sales Business Units and the company’s sales-related activities. Promote the ICS corporate brand while further strengthening ICS-vendor relationship. Bachelor’s Degree in Marketing or Information Technology or any business-related course. At least 3 year(s) of related marketing experience, preferably in the IT industry. Good interpersonal skills: with excellent oral / written communication; high customer service orientation; with multi-tasking skills. Strong proficiency in PC applications; a technically inclined person would have an advantage. Female, not more than 32 years old. As an Account Executive, you will be responsible for fully immersing yourself in the clients’ business, products, consumers and competition. You will be joining one of our exciting client teams!